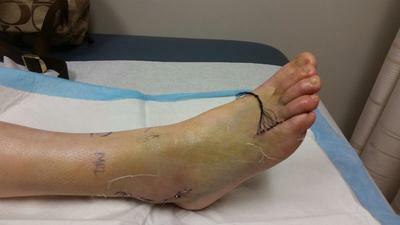 I had surgery to repair a tear in my peroneal tendon and had a neuroma removed on Jan 5th. I have been having severe pain in my foot since Monday night. I had a new cast put on that morning, I finally went in on Wednesday morning and they replaced the cast thinking it was too tight. The pain returned that same night. I have been taking Advil and also Percocet, but trying not to take the Percocet as often. My whole foot feels like it is being crushed and it feels like I am being stabbed in the top of my foot. I have kept it elevated every day since the surgery. As soon as I stand up, my toes turn purplish and look swollen. When I sit down, the color goes back to normal. I just want to know if this pain is normal from healing or is something wrong. I don't feel like the cast is too tight as the nurse put quite a bit of padding inside this time and I can feel it shift a bit, but not too much that it feels loose. 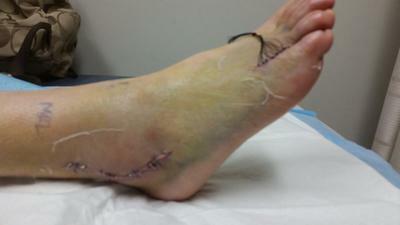 The pictures are from Monday when the cast was put on a week after surgery and stitches and staples removed. Let me start off by saying that your questions should really be directed to your surgeon. Having given you my disclaimer I will offer a few points. It is only two weeks since surgery so the fact that you are still having pain is not so surprising. The problem with foot surgery unlike other orthopedic procedures such as shoulder surgery or even knee surgery is that you have to actually bear weight on the site where the surgery was performed. This has to cause pain. can lead to pain simply from swelling. In your particular case, you have had surgery on two separate areas of the same foot, so that only adds to the problem. I am not sure how old you are, but if you are over lets say 40 years of age, there can also be issues with your venous system, the blood vessel system, that returns blood to your heart. If there is any compromise in your venous system such as varicose veins for example, the blood trying to return to your heart will be slowed and that will cause pooling of blood in your foot that will also contribute to the pain you are experiencing. Looking at the pictures you supplied, you skin color appears normal and there does not appear to be too much swelling, although I would have liked to see a picture of your other foot for comparison. So... from the other side of the internet your foot appears normal and typical of what I would expect to see two weeks post surgery. Now, if the onset of this pain occurred just after a new cast was applied and it was determined that the new cast was too tight, you have to rule out the possibility of a superficial phlebitis on top of the foot from excessive cast pressure. I have no way of telling from your pictures but you might want to run that by your surgeon. Simpler causes of pain on top of your foot from a tight cast would include irritation of the extensor tendons which are the tendons that allow you to bend your toes upwards. You would also have to rule out damage to the nerves that travel down the top of your foot. Again, the pictures do not allow me to rule those things out. In theory if a looser cast were applied, your symptoms should have begun to subside; they have not. Of all the conditions that I just mentioned, a superficial phlebitis, could still cause pain, whereas nerve entrapment or tendonitis would begin to resolve. Bottom line: if your pain is not subsiding (and with normal healing, pain should subside by some degree every day), then it is time to give your surgeon another call. Thank you for your in depth response. I appreciate it. The pain is better each day, but the strange thing is that it seems to hurt worse when I have my foot elevated (3 pillows under it) and when it is down (walking, sitting normal) than when it is simply straight out in from of me (as in sitting in a recliner). It is always worse at night when trying to sleep. Again, thank you! I will reassess the pain on Monday and call my doctor if it has not improved.